The Indigenous People of Biafra, IPOB, has blasted as unprofessional and misleading, the report of Financial Times of London on the activities of the group and what they portend ahead of the forthcoming general elections. 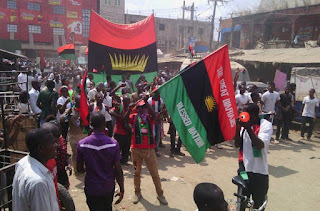 According to IPOB, the report on FT was not only contrary to the “ethics of investigative professional journalism” but their headline “Echoes of Biafra war as Nigeria looks to polls” was misleading, Vanguard writes. “This unprofessional conduct calls for holistic review on the part of the proprietors of the Financial Times. It is our position that had a reputable media organisation like Financial Times embarked on investigating their sources of information before hand, they would have been well-informed of the fact that IPOB is non-violent in their quest for restoration of Biafra,” the statement read. “Does it mean that the editors of Financial Times did not see and, in fact, know that Nnamdi Kanu is not in hiding but instead was taken away by the army when they stormed his home and killed 28 people? Did they not see the bullet riddled house and damage done to his family home? Are they not aware of the existence of a video taped interview clearly showing the Defence Minister of Nigeria, Mansur Dan Ali, admitting that they sent soldiers to Kanu’s home? “Where went the conscience of the highly revered editors of this reputable publishing giant before they authorised this misleading report?